Dimensions 38'9" by 26'3" by 11'11"
Power plant One 450 hp (336 kW) Hitachi Ha-13a 9-cylinder radial engine driving a two-blade wooden propeller. The Ki-55 was a trainer version. 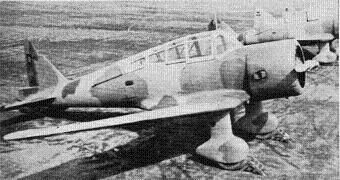 The Tachikawa Ki-36 was an Army cooperation aircraft, intended primarily for battlefield observation but with some ground-attack capability. It was designed to operate from small airstrips and to be capable of maneuvering at low speeds and altitudes. The design went back to May 1937, when the Army issued a specification for a fast monoplane reconnaissance aircraft with a good rough field capability. The design team, under Endo Ryokichi, achieved the required low-speed maneuverability by combining a light airframe with large wings. The wings were swept well back to give the pilot good visibility, while windows under the wing center sections gave the observer a good field of view. Its control surfaces were unusually large, which made it very light on the controls. The prototype first flew on 20 April 1938 and the design went into production in November 1938. Its characteristics made the aircraft highly vulnerable, and it could only be effectively utilized in controlled airspace, which meant that it saw most of its action in China. A small number were given to Thailand. Its characteristics were suitable for a trainer and the Ki-55 was a modified version produced for this purpose.